The RTL-SDR software defined radio is often used to receive signals from NOAA APT weather satellites. Once decoded these signals produce a freshly captured image of the earth over your current location. We have a simple tutorial on setting this up here. However, recently Marco Johansson wrote into RTL-SDR.com to explain an alternative method to the one described in our tutorial. His method uses rtl_fm as the receiver instead of the GUI based software SDR# and uses several other pieces of software to automate the whole process. Marco believes that his method may be useful for some people and his tutorial is presented below. Also, if you are interested Marco has a WxtoImg generated webpage which shows all his recently received images here wxsat.haastaja.net. Note that the following tutorial is written by Marco Johansson. As a Windows user I had some serious problems using an RTL-Dongle as a receiver for WxtoImg. Signal drops, CPU load, and no receiver control. I had to use 5 different pieces of software to get automatic reception to work and every day one of the programs had some weird problems causing the whole system to stop working. I read several forum posts about similar problems. A huge bit of help came from WxtoImg’s own forum where a user told how he was able to use rtl_fm as a receiver. His system was Linux based, so I was not able to use his scripts, but it gave me enough information to find a Windows based solution. I stumbled on to a software program that solves my problem totally. It is originally made to control Windows MCE (Media Center), but since it’s release it has been enhanced to work as a universal remote control for the Windows system. In WxtoImg I selected “Baykal” receiver, port COM1 and 2400baud. The protocol for remote control is very easy to understand and after every command WxtoImg sends CR/LF to receiver, which is mandatory to get commands to work. Control commands are handled with MCE controller. It listens to COM2 (bridged with COM1) and when it hears a valid command string (A Magic ‘word’) it activates a task. Tasks are .bat files, one for every satellite and a “kill” to stop receiver after the satellite pass. When satellite is coming (one minute before it is over head) WxtoImg sends a command “MUA” that triggers “kill.bat”. 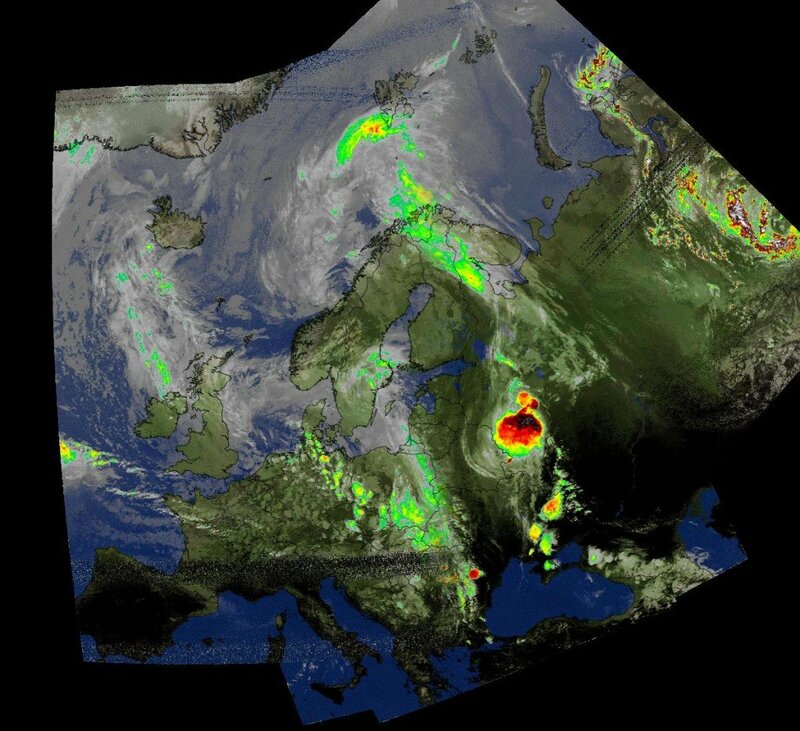 Then WxtoImg sends a command “RF0xxxxxxx” where xxxxxxx is the frequency of the satellite, “1371000” for NOAA19 – this triggers “rec-noaa19.bat”. When the pass is over, Wxtoimg sends again “MUA” to kill the receiver program. Now I can control recordings directly from WxtoImg without any other software (Orbitron, SDR#, DDE client etc). My system is Windows 8.1, I have not tested this in 7, 8 or 10 but I believe it should work without any modification. The HW ID of the RTL-Dongle I use for wx_rtl_fm.exe is “3” (‘-d 3’ in script). If you have only one RTL-Dongle, then this should be set to “0”. I use the bandwidth of 55 kHz that seems to be enough for good APT reception including doppler error as in this method the doppler error is not corrected in the receiver at all (no AFC). .bat’s used in this are very dirty hacks and there are lot’s of improvement available for sure – but it works! Also, the remote protocol for Baykal receiver actually sends two more commands, one is used for telling the modulation of the transmission (RM NFM) and second to do something I do not know (MUF). 1) “MUA” => Kill all wx_rtl_fm.exe processes currently running (if any). This happens one minute before satellite pass starts. 2) “RF0xxxxxxx” => Start wx_rtl_fm & SoX, xxxxxxx=frequency of the satellite and is used to select correct .bat for different satellites (see MCE Control XML-file for details). This happes when satellite pass starts. 3) “RM NFM” => Not used in my system. Could trigger something fun if needed :). This happens right after ‘RF0xxxxxxx’ command. 4) “MUF” => Not used in my system. Could trigger something fun if needed :). This happens right after ‘RM NFM’ command. 5) “MUA” => Kill all wx_rtl_fm.exe processes currently running. This happes right after satellite pass. SoX is a very powerfull tool for audio manipulation. There are options that could greatly improve the audio quality of the received signal – denoice, better dynamics etc. I am not that keen to try everything SoX could do as the results are already very good in my system, but if there are someone who knows better ways to handle SoX then please do not hesitate to comment! kill.bat is triggered by MCE control and calls kill-wx_rtl_fm.bat to do the actual killing. Recording is started after MCE Control gets the correct ‘word’ from WxtoImg. For every satellite there are separate ‘words’ and separate .bat files. And finally, the MCE Control magic ‘words’. By default, MCE Control understands over 200 separate commands originally meant to remote control Windows MCE (Media Center). Fortunately, one can create their own commands and get MCE Control to do much more – control Wx-system! Hello everyone. Thanks for the tutorial. [18-02-10 11:36:39] MCEC: No user defined commands loaded; MCEControl.commands was not found. [18-02-10 11:36:39] MCEC: 267 commands available. [18-02-10 11:36:39] MCEC: You are running the most recent version of MCE Controller. Cannot find Baykal receiver. Is this supposed to be in WXtoImg list of receivers? Hi! Thank you for this tutorial! It’s great work. I’m using Windows and had the same problems with using an RTL-Dongle as a receiver for WxtoImg. But after this tutorial all is going well. As well I chose other software for emulation virtual COM-port – Serial Port Emulator (http://www.eltima.com/products/serial-port-emulator/), because it’s seems to me with comfortable interface and allowes more options for setting the data. Hi! Thank you for this tutorial! It’s great to work. I’m using Windows and had the same problems with using an RTL-Dongle as a receiver for WxtoImg. But after this tutorial all is going well. As well I chose other software for emulation virtual COM-port – Serial Port Emulator (http://www.eltima.com/products/serial-port-emulator/), because it seems to me with comfortable interface and allows more options for setting the data. I indeed selected every available receiver that WxtoImg supports and watched the output from COM port WxtoImg was using to see what kind of command WxtoImg actually sends and in what format. Baykal commands where way the easiest to implement, as they where clear human readable strings with very clear meaning and the most importat was that after every command WxtoImg sent CR/LF to receiver – mandatory to get MCE Controll to notice that “Hey, there was a Magic Word!”. These are Uniden scanner commands.